Jewish Academy Says Hey, Mozart! Jewish Academy Alumni @ NHCC: This is an article … with great musical news … by Mary-Ellin Brooks, Community Relations Coordinator of the Jewish Academy of Arts & Sciences. Mary-Ellin’s got the copyright; all rights reserved. This article appears in the October 2013 issue of The New Mexico Jewish Link. It’s no secret that many of world’s greatest composers were Jewish, and that music permeates every aspect of Jewish life and culture. Two young composers, both former students at the Jewish Academy of Arts & Sciences, have the opportunity to continue that tradition. Analise Granados and Mark Koshkin are among the 17 winners of the 2013 Hey, Mozart! New Mexico young composers competition. Their melodies, titled “Temptations” and “Running Kitty,” respectively, will be professionally arranged and performed at the Hey, Mozart! concert in November. Incorporated in 2006, Hey, Mozart! New Mexico is a creative and collaborative intergenerational music-making project centered on a children’s composition competition. Children aged 12 and under from throughout the state submit an original melody to the project either in music notation or in a recording of a performance. The emphasis is on the original melody, not the child’s performance skills. From the pool of melodies, 16-18 are selected to become part of the original project. The children work with a professional or university student arranger, also a New Mexico resident, to create an orchestral version of the melody. Hey, Mozart! New Mexico presents a concert with its partner, the National Hispanic Cultural Center, at which each child performs his or her melody. The children then hear their melodies for the first time, fully realized and performed by a live orchestra, before an audience of 600 people. A professionally produced DVD is made of the performance, so they can enjoy the experience – and perhaps be re-inspired – whenever they like. Analise Granados is currently a fifth grader at Manzano Day School, though she attended the Jewish Academy (then known as Solomon Schechter Day School of Albuquerque) for four years. 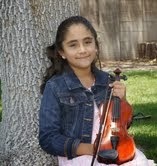 She began studying violin at age four, and currently plays with the Albuquerque Junior Strings Orchestra. Her teachers are Laura and Maria Dickinson. Her favorite subjects include writing, reading, and drawing. A very active young lady, Granados also loves to swim, and has danced in a production of The Nutcracker. Like Granados, Mark Koshkin attended the Jewish Academy of Arts & Sciences, where science was his favorite subject, and completed fifth grade in May of this year. He likes that there is a variety of music everywhere. He enjoys video games, hiking, climbing and simply daydreaming (often when creative ideas are born), and is currently in sixth grade at 21st Century Public Academy, a local charter school. Both Granados and Koshkin studied music with Pauleta Hendrickson at the Jewish Academy. Hendrickson, who has a diverse background in music ministry, music and physics, explained that Analise Granados composed her melody for her own instrument, violin. “Analise lit up when I told her about Hey, Mozart! and was excited about the opportunity to have her melody orchestrated. Her melody was simple, yet very complete. She called her piece ‘Temptations,’ and it offers the listener a few pieces of repeated melody, then transitions into a similar melody, with just enough difference to make you want to hear both at once – truly ‘tempting,’” said Hendrickson. Granados agrees. “You can feel the title in the song,” she said. On working with local musician and arranger Art Sheinberg, she commented, “I really like how [he] is arranging my piece, what he turned it into. Participating in Hey, Mozart! helps my violin career, too. Composing is so creative.” Granados plans to continue exploring the composing process as part of her music studies. Hendrickson sings with Quintessence: Choral Artists of the Southwest, who will be featured performers at this year’s Hey, Mozart! New Mexico concert. Granados’ “Temptations” was arranged by Art Sheinberg of Albuquerque, and Koshkin’s “Running Kitty” was arranged by Steve Paxton of the University of Santa Fe. The free concert will be held on Friday, November 1, 2013 at 7:00 p.m. at the National Hispanic Cultural Center’s Journal Theatre in Albuquerque, and will feature all of the 2013 Hey, Mozart! composers. By Mary-Ellin Brooks, Community Relations Coordinator at the Jewish Academy of Arts and Sciences. Mary-Ellin also sings with Quintessence: Choral Artists of the Southwest, and is thrilled to be a part of this year’s Hey, Mozart! performance. The Jewish Academy, New Mexico’s only Jewish elementary school, is enrolling year-round in all grades.